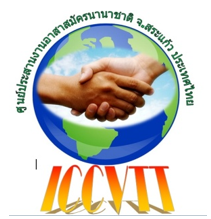 The organization I am volunteering with is called ICCVTT, or International Coordination Center for Volunteer Teachers, Thailand. That name makes it sound like a large, international organization but it really is basically just one young man with a strong desire to help the children of Sakeao Province, Thailand. Jason (Thai name “Wichai”) Nontakan is a mild-mannered 32 year old primary school English teacher. He has worked here at Watputthisan School in Nong Mak Fai for two years and he started the volunteer English program shortly after arriving. Slowly, he has expanded the program to other schools in Sakeao: at present at least 24 schools participate in the program. Since inception the program has hosted 113 volunteers from 19 different countries. The province is too big for Jason to personally greet and supervise volunteers assigned to most of the other schools so he counts on the presence of a “volunteer champion” at each school: someone who takes responsibility for helping the volunteer get to the school, adjust to the culture and local customs, and to become a teacher who can help advance the English program of the school. A few dedicated volunteers who have seen and admired what Jason is trying to do, have stepped up into (volunteer) administrative roles for ICCVTT. An ex-volunteer from New Zealand helped a lot during the early years/month. In recent months, my co-volunteer Laurian (pictured with Jason at right) has been working as Jason’s administrative assistant: helping with website administration, interviewing/screening volunteers, and developing documents to help clarify rules and expectations for volunteers. She loves it here: she has grown so attached to the children and helping Jason make the program successful is something she is strongly invested in. Having served as webmaster for my friend Jessie’s China/Singapore volunteer company for the last five years, I know that building and running a volunteer organization is a daunting task: it takes determination and hard work to bring everything together and keep it running smoothly. Actually, it never runs smoothly- there are always problems. while massive international humanitarian programs worked to provide relief. 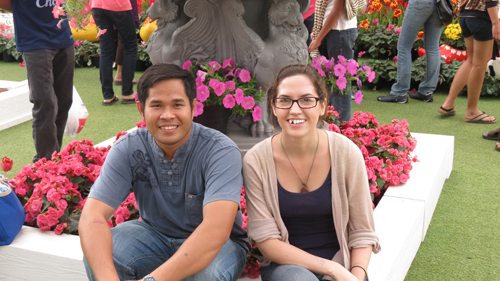 Jason’s parents were offered a choice between immigration to the USA or staying in Thailand. Jason’s father didn’t want to go to the USA so the family stayed, settling in a small village in southern Sakeao where Jason was born just a few months later. Three of Jason’s mother’s siblings did emigrate: two to California and one to Connecticut. 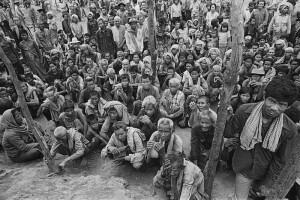 Some from Jason’s father’s side of the family never made it out of Cambodia and were never heard from again: likely victims of the genocide. Jason’s parents and their four young children arrived at the small village in southern Sakeao with nothing but the clothes on their backs. They sought any shelter they could find which turned out to be a chicken house owned by a villager. They worked as manual laborers for years. When Jason’s oldest brother reached 6th-grade, he left home to find work in the Army and his wages helped feed the family back home. Later, a second brother and older sister did the same and the combined contributions of the children helped their parents eventually find their way to buy a little land and make improvements to the home that started as a chicken-house: making it more habitable for humans. Here, while Jason was a growing boy, they raised rice to provide a living. They were still poor, but there was enough food now. Jason became the first member of his family to attend university, made possible by the financial help of his parents and siblings. 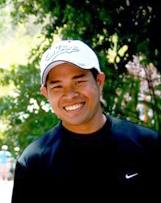 He began attending Burapha University in eastern Thailand in 2001 and majored in Elementary Education. An abiding faith in the teachings of the Buddha had always played an important role in his life and he was serious about the possibility of dedicating his life to helping others as a Buddhist monk. 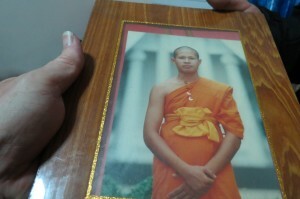 He majored in education and, when he completed his sophomore year at Burapha, he enrolled in a three-month Buddhist Monk training program at Wat Phra Dahmmakaya Temple in Phatumtani Province (near Bangkok) whic his the largest Buddhist Temple in the world. He always planned to return to university to obtain the degree which his whole family had worked so hard to make possible. When he graduated with honors from Burapha University in 2005, he returned to the Dahmmyaka Temple to work as a volunteer teacher to the monks for 6 months. Jason says his decision to take a job as a teacher in the public education system, rather than to become a monk educator was prompted by his desire to help his family. They were doing OK but still had very little and lived a hard life. He knew as a teacher he could make money and help his family so that’s what he did. He got his first teaching job at a Sakeao elementary school. At the same time he began working on his Master’s degree on weekends. After two years, he needed to write a Master’s thesis to finish his degree so he resigned from his teaching job and went to America where he could work on the thesis while earning some money to help his family at the same time. He lived with his mother’s brother’s family (whom Jason considers another father and mother to him) in Brea, California and wrote his thesis about the importance of the Buddhist Temple in the social development of Thai-Americans. After a year, he completed his thesis. Entitled ‘Analysis Values and Roles of Temple as Thai Community Learning Resource: A Case Study of Wat Thai of Los Angeles, CA, USA,” he received “The Excellent Thesis” award. He received his Masters degree in Developmental Studies with a 4.0 GPA average. After completing the Masters, he stayed in California an additional 4 years to save money. He worked two and three jobs at a time, often jeopardizing his health through his determination to save enough to help his family when he returned. He returned here to Sakeao in 2012 and was hired as an English teacher at Watputthisan School. While in California, he had volunteered at a local Buddhist temple as a Thai teacher and that experience had started him thinking about how foreign English-speaking volunteers might help the children of Watputthisan School. He placed ads for volunteer English teachers in Thai newspapers, Thai-oriented internet sites and in Thai newspapers in the USA and UK. He knew there were many westerners living and visiting popular Thai locales like Bangkok and Chiang Mai and he hoped to entice some of them to come and volunteer in Sakeao. By asking for only short-term commitments (3 to 4 weeks) and by making the program absolutely free to the volunteer, he was able to enlist the first volunteers in the fall of 2012. Watputthisan’s principal at first balked at supporting the program but Jason convinced him that it would cost the school little (about $5 US per day per volunteer) and benefit the school greatly. From the beginning, however, it was clear the principal was not really behind the program and when additional expenses arose, the principal refused to contribute school moneys to cover them. Things such as improving the volunteer’s quarters (e.g. by putting up curtains), providing transportation to pick up or drop off volunteers at bus stations or to visit local sites of interest on weekends were things that Jason has ended up paying for out of his own pocket, Jason will transfer in March or April: happily, it is to a school closer to his home and with the promise of good support for the volunteer program. At present, the volunteer program’s reputation has spread and Jason has requests from many schools in Sakeao and several other provinces to be included in the program. With the promise of staffing and financial support from the school he will transfer to soon, the future looks bright for the ICCVTT volunteer program. To maintain its ability to offer free volunteer placements, however, it will probably continue to operate on a shoestring budget. Because I know Jason is hard-working and honest, and because I’ve seen the difference the program can make in the happy faces of the children here, I have made a small donation to the program using the website page that Laurian just added. If you think you might be interested in helping to keep this program running you might consider making a donation of your own by clicking here. Any amount will help and, although your donation won’t qualify for U.S. tax-free status, it will make a difference in the lives of thousands of young people here in rural eastern Thailand for whom basic English skills can greatly improve prospects for economic opportunities. Retired software engineer from New Jersey, USA, happily married to Grace for 30 years, proud father of Michael for 29 years, I am enjoying traveling and teaching English as a second language in my retirement.